vNeed to feed a crowd? 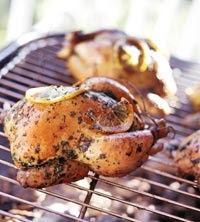 Use kitchen shears to snip these easy grilled game hens in half before serving. Half a hen is still a satisfying portion. Thaw Cornish game hens, if frozen. Finely shred enough lemon peel from 1 of the lemons to make 2 teaspoons peel. In a small bowl combine herbs, salt, pepper, and lemon peel; set aside. Cut one and a half of the lemons into slices; cut remaining lemon half into four wedges. To prepare Cornish hens, remove giblets, if present. If desired, remove skin from hens. Rinse hens; pat dry. Place hens on a plate or baking dish. Place 1 lemon quarter in each hen cavity. (If using chicken breasts, omit lemon quarters.) Tie drum sticks to tail using heavy kitchen string. Twist wing tips under the back. Generously pat outside of birds with herb mixture. Lay lemon slices over top. Wrap tightly with plastic wrap and chill in the refrigerator for 12 to 24 hours. Remove hens from grill. Cover with foil and let stand 10 minutes before carving. Makes 4 servings. Calories 676, Total Fat 45 g, Saturated Fat 12 g, Monounsaturated Fat 20 g, Polyunsaturated Fat 9 g, Cholesterol 346 mg, Sodium 651 mg, Carbohydrate 3 g, Total Sugar 0 g, Fiber 0 g, Protein 60 g. Daily Values: Vitamin C 28%, Calcium 9%, Iron 14%. This entry was posted on 4:04 PM and is filed under Chicken . You can follow any responses to this entry through the RSS 2.0 feed. You can leave a response, or trackback from your own site.